US Army Air Corp and US Army Counterintelligence Corp. Discharged one month after original enlistment in January 1942 as an Aviation Cadet at King City, US Army Air Corp Training Detachment, CA. Drafted at Bufffalo, NY, Dec. 1944 and discharged Nov. 1947 at Fort Lawton, WA. 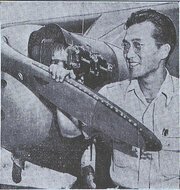 Excerpts from local newspapers in 1941: George Aihara, 22, San Jose State College senior flying student, became the first Japanese in the United States to get a federal flight instructor's rating. Holding both a student pilot's license and a commercial license, Aihara, with 450 hours of solo flying to his credit successfully passed his instructor's flying test. Aihara will remain at the local airport as instructor of the San Jose State College flying clubs.